Malé (Dhivehi: މާލެ), (pronooncit: /məːle/) is the caipital an maist populous ceety in the Republic o Maldives. It is locatit at the soothern edge o North Malé Atoll (Kaafu Atoll). It is ane o the admeenistrative diveesions o the Maldives an aw. Tradeetionally it wis the Keeng's Island, frae whaur the auncient Maldive Ryal dynasties ruled an whaur the palace wis locatit. The ceety wis an aa cried Mahal. Umwhile it wis a wawed ceety surroondit bi fortifications an gates (doroshi). The Ryal Palace (Gan'duvaru) wis destroyed alang wi the picturesque forts (kotte) an bastions (buruzu) when the ceety wis remodelled unner Preses Ibrahim Nasir's rule efter the aboleetion o the monarchy. In recent years, the island haes been considerably expandit throu landfillin operations. Ower the years thare hae been mony coup attempts an protests centred in Male as a result o demand for greater democracy in the Maldives. Awtho Malé is geographically locatit in Male, Kaafu Atoll, admeenistratively it is no considered pairt o it. The central pairt o the ceety is formed bi Malé Island. Three mair islands are pairt o the ceety. 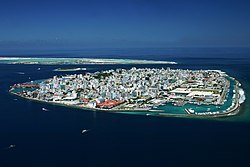 A commercial harbour is locatit on Malé Island. It is the hert o aw commercial activities in the kintra. The central island is hivily urbanizit, wi the biggit-up aurie takin up essentially its entire landmass. Slichtly less nor ane third o the naition's population lives in the caipital ceety, an the population haes increased frae 20,000 fowk in 1987 tae 100,000 fowk in 2006. Mony, if no maist, Maldivians an foreign wirkers in Maldives fynd thairsels in occasional short term residence on the island syne it is the anerlie entry pynt tae the naition an the centre o aw admeenistration an bureaucracy. The whole island group, the Maldives, is named efter its caipital. The wird "Maldives" means "The islands (dives) o Malé'". The first settlers in the Maldivian islands wur Dravidian people who arrived frae the neighborin shores o the modren Indian Subcontinent an coastal Ceylon. Comparative studies o Maldivian lingueestic, oral, an ither cultural tradeetions, in addeetion tae folklore, pynt tae a strang Dravidian influence on Maldivian society, centered in Malé, frae auncient times. The fowk o Giraavaru, an island locatit in Malé Atoll (nou a tourist resort, efter the forced diaspora o its indwallers) claim tae descend frae the first settlers o the Maldives, none ither than the auncient Tamils. It is said that Giraavaru fishermen uised tae gang regularly tae a certaint lairge sandbank (finolhu) at the soothren end o thair atoll tae clean tuna fish efter a guid catch. Owin tae the lairge amoont o tuna fish offal an bluid, the watters aroond that sandbank leuked lik a big puil o bluid (maa ley gandeh). "Maa" (frae the Sanskrit मह "Maha"), meanin big, an "Lē" meanin bluid. Tradeetionally the first indwallers o the Maldives, which include the Giravaru fowk, didn't hae keengs. Thay lived in a semple society an wur ruled bi local heidmen. Houiver ane day a prince frae the Subcontinent cried Koimala arrived in the Malé Atoll sailin frae the North on a big ship. The fowk o Giraavaru spottit his vessel frae afar an walcomed him. Thay allaed Prince Koimala tae settle on that lairge sandbank in the midst o the watters taintit wi fish bluid. Trees wur plantit on the sandbank an it is said that the first tree that grew on it wis the papaya tree. Houiver this coud refer tae ony tree that bears edible fruit as the archaic Dhivehi wird (an Mahal wird even the day) for fruit wis the same as that for the papaya (falhoa). As time went bi the local islanders acceptit the rule o this Northren Prince. A palace wis biggit an the island wis formally named Maa-le (Malé), while the nearest island wis named Hulhu-le. The names o the main fower wards or diveesions o Malé Island are said tae hae been gien bi the aboriginal Giraavaru fishermen: Maafannu frae "maa" (big) an "fannu" (a place whaur a veelage path meets the sea), Henveiru frae "en-beyru" (oot whaur fishermen got thair bait), Galolhu frae "galu-olhu" (stone groove) an, Macchangolhi frae "mathi-angolhi" (windward path-fork). The modren-day ceety wis foondit as a tradin post bi the Portuguese in the 16t century. Tourism is the lairgest industry in the Maldives, accoontin for 28% o GDP an mair nor 60% o the Maldives' foreign exchynge receipts. The GDP per capita expandit bi 265% in the 1980s an a further 115% in the 1990s. Ower 90% o govrenment tax revenue comes frae import duties an tourism-relatit taxes. Malé, the caipital, haes mony tourist attractions an nearbi resorts. The central harbour an port o the Maldives is locatit in Malé, the centre for aw commercial activities. Maldivian, the airline o the Maldives, haes its heid office in Malé as daes the airline FlyMe. Malé haes a tropical monsoon climate unner the Köppen climate classification. The ceety featurs a mix o baith wet an dry saisons, wi the wet saison lastin frae Mey throu December an the dry saison coverin the remainin fowr tae five months. Unlik a nummer o ceeties wi this climate, Malé experiences relatively consistent temperatures throughout the coorse o the year, wi an average heich o 30 degrees Celsius an an average law o 27 degrees Celsius. The ceety averages slichtly mair nor 1600 mm o precipitation annually. ↑ Maloney, Clarence. "Maldives People". Retrieved 2008-06-22. ↑ "Contact Us." Maldivian. Retrieved on 29 April 2011. "Corporate Head Office No: 26, Ameer Ahmed Magu Male' 20026, Rep Of Maldives"
↑ Home. FlyMe. Retrieved on 29 April 2011. "Villa House, 5th Floor No.7, Kandidhonmanik Goalhi P.O.Box 2073, Male’, Maldives"
This page wis last eeditit on 5 Mairch 2018, at 06:54.